Japanese manufacturers were quick to catch up on the lead American firm Motorola had established in cellular phones. The Mitsubishi Roamer was an early example. Unlike most brick phones, the battery is on the side rather than on the back of the phone. This makes it more like a slab, rather than a brick, perhaps making it easier to fit into a briefcase. 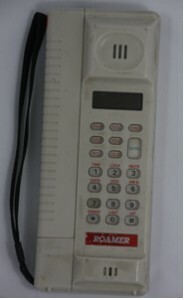 Although mostly ignored by collectors today, the Roamer was one of the most popular cell phones in the UK in the second half of the 80s. Several of the service providers, as the dealers were then called, offered this model. BT also sold a rebadged version of the Mitsubishi Roamer, as the BT Pearl. There is a grey version as well as the cream one shown here. Few of these phones seem to have survived. Perhaps because the design is not particularly attractive. These phones are rare and do not come up for sale on eBay often. It is hard to judge values, but it seems to have slipped under the radar of most collectors at the moment. The BT Pearl is identical, except for the badging.